The Extreme EX7232CR is a combination tool box set which includes EX7217 roll cab and EX7215 top chest. • Ball bearing drawer glides load rated for 250 lbs. • Roll-out shelves can hold up to 500 lbs. 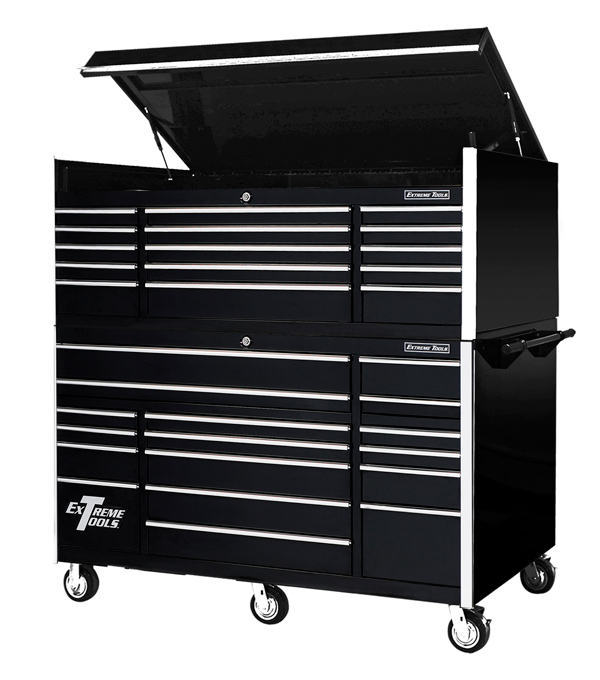 The72" Professional Series tool boxes feature an exclusive patented design. Drawer latch assembly has a self-adjusting spring lever action allowing the latch lever to go up into the lock bar for increased security and smoother drawer action. There are no spot welds on drawer fronts, hutch or side cabinet. Drawer lock bar assembly uses single cylinder lock design for quick access, and the double steel wall drawer front design gives greater strength to each drawer. The modular drawer design allows drawer configuration to be rotated. There are double channel spot welded support brackets on bottom underside of each drawer reinforces and prevents sagging. 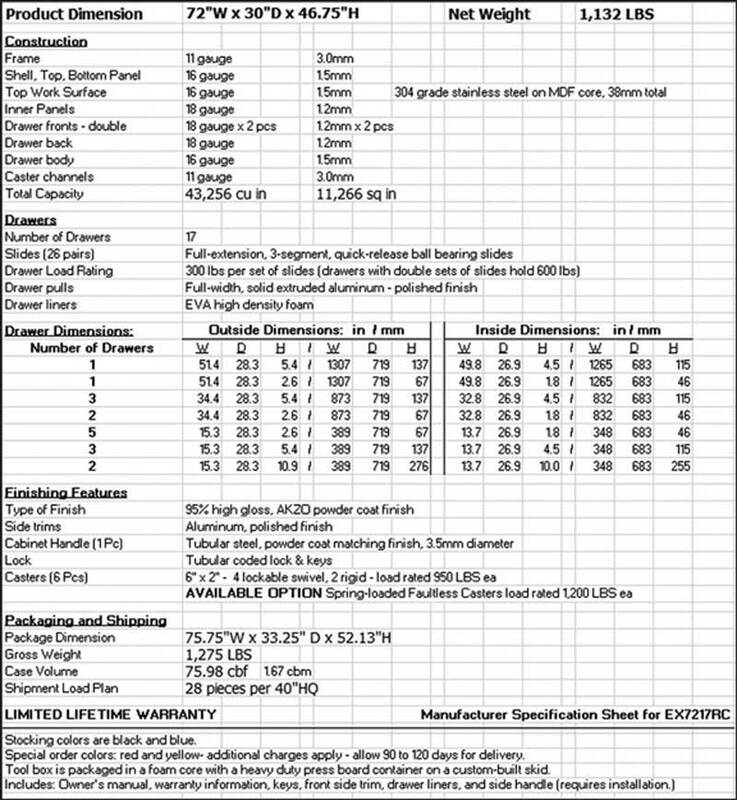 • Dimensions 72" x 30" x 44 3/4"
See Extreme EX7217 Roller Cabinet Specifications. 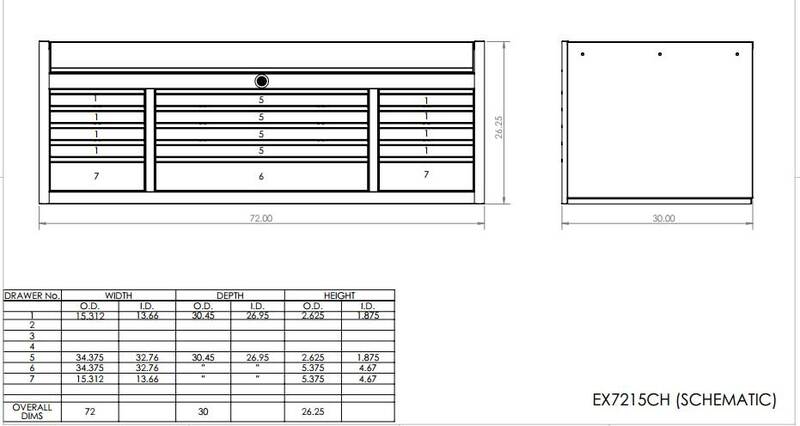 Extreme Tools® 72" 15 Drawer Triple Bank Professional Top Chest has dimensions of 72”W x 30”D x 26-1/4”H. 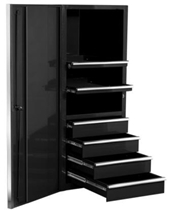 It includes 15 drawers with 30” cabinet depth, as well as two gas lifts to support top lid. The Extreme EX7215CH is made of super heavy duty steel construction. It also features full extension drawers with heavy-duty ball bearing glides on all drawers, and the drawers can handle a 300 to 600* lb load capacity per drawer (*drawers with double glides). Also includes theft-proof locking system. Limited Lifetime Warranty applies to all EX Professional Series models: EX2404SC, EX5501HC, EX5510CH, EX5511RC, EX7201HC, EX7215CH, EX7217RC, EX7612RC only. 5 Year Limited Warranty applies to all EX Standard Series, PWS Series, RX Series, and TX Series (excluding TXRSB-3605BK series which has a 1 Year Limited Warranty) tool storage products (chest, cabinet, side cabinet or workbench). Please note: TXRSB-3605BK Extreme Tools® Road Box is intended for on road use only. Product damage may occur during off-road transport and usage and is not considered to be a defect in product. Off-road usage is not covered by the 1 Year Limited Warranty and will void product warranty. 90 Day Limited Warranty on all electrical components contained in or on any Extreme Tools® tool box series. To activate your warranty, a copy of the receipt must be mailed along with the warranty card correctly filled out and returned to Extreme Tools® within 30 days of purchase. Extreme Tools® obligation to repair or replace defective parts in accordance with the terms set forth herein shall be the buyer's sole and exclusive remedy. Extreme Tools® shall not be liable for any damage for loss of the product or consequential damages of any kind. The company neither assumes nor authorizes any other person to assume for it, any other liabilities beyond the conditions set forth in this warranty, in connection with the product. Some states do not allow the exclusion or limitation of incidental or consequential damages, so the above limitation or exclusion may not apply to you. This warranty gives you specific legal rights, and you may also have other rights which vary from state to state. If you believe product is defective, please call Extreme Tools® at 630.369.9303 or email sales@extremetools.net. We will require pictures of the defect, the model number, the serial number, the date of purchase and a description of the issue. If the product is defective, we will replace the defective part at no cost to you. Please do not ship your product back to the store, distributor, or to Extreme Tools® unless we send you written instructions for return. In the event that it becomes necessary for your product to be returned, we will notify you as to how to proceed with a return goods number (RGA). A copy of your original purchase receipt must accompany the return. Extreme Tools® shall not be liable for, nor shall this warranty include or apply to, any loss or damage caused by or resulting from the following; (1) Use of the product in a manner other than as specified in this product manual; use of the product beyond its rated capacity or specifications; (2) Modification, alteration or repair not performed by Extreme Tools® or its authorized subcontractors or third parties approved by Extreme Tools®; (3) Floods, Fires, earthquakes, tornado, vandalism or other acts of nature, including windstorms, lightning and hail damage or any other insurable loss under standard fire and extended coverage plans; (4) Abuse, misuse, negligence handling, improper or inadequate maintenance, tampering, or accident; chemicals that can damage powder coat finish or causing rust; (5) Accessories, alterations, attachments or other devices not furnished by the company or (6) Failure of buyer to follow operating procedures or the instructions of the company, or to provide a suitable operating environment. All customers receiving shipments of our products are responsible to inspect shipments before accepting; Extreme Tools® will not be responsible after shipment of product is accepted if product is damaged or has missing parts. • Do not open more than one drawer at a time. 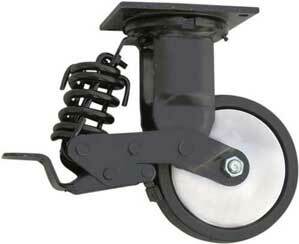 • Apply brakes on casters when not moving unit. • Do not step in or on drawer. Tools and materials shown on Extreme Tools® or any other website are not included unless specified. Extreme Tools®, Inc. develops innovative designs in professional and portable tool storage. 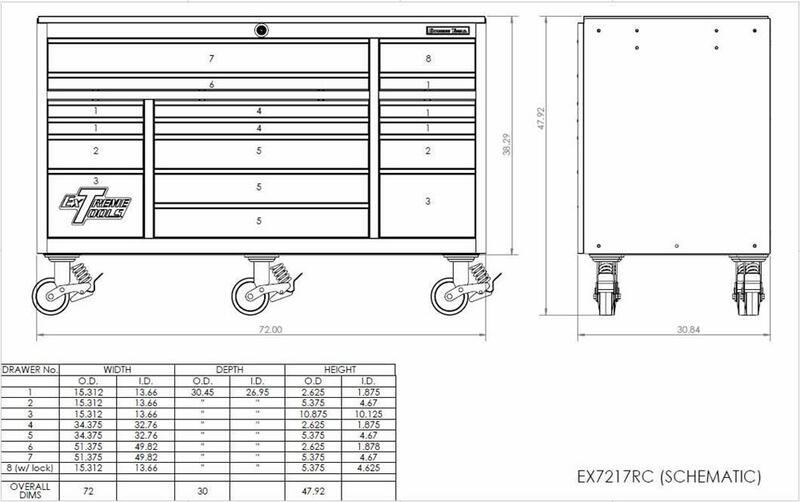 Our goal is to create and build the highest quality tool boxes at extremely competitive prices to make owning a tool box affordable for everyone from the mechanic to the farmer to the do-it-yourself homeowner. With more than 30 years of working knowledge and experience in the automotive industry, Extreme Tools ®, Inc. has a proven track record as an innovator and leader in the professional tool storage market. That practical understanding has been the driving force that makes our patented designs so unique. Extreme Tools® Inc. provides a full line-up of products to suit a wide range of customers needs. The EX Professional Series are distinctively designed and patented tool boxes that surpass our competition in quality, reliability and ingenuity. The TX and RX Series offer greater quality with specialized features at a more affordable price. While the PWS Series, the next generation in tool storage, makes transporting your tools convenient and easy. We ship to the 48 Continental United States. Shipping to Canada is more involved; it can be arranged by phone. Shipping heavy freight (generally anything more than 150 pounds ) will be shipped with a freight carrier. Their are many carriers, some Regional and some National. There are many variables that go into choosing a company to deliver freight items to you. • Freight Carriers normally deliver to commercial businesses that receive freight regularly. Carriers do not call ahead to announce a delivery. They arrive and expect to be unloaded by the consignee. • When receiving freight, consignees must be prepared to ofﬂoad their freight from the back of the truck. Commercial businesses normally have fork lifts or loading docks the trucker can back up to. • Residential or home deliveries are generally out of commercial areas and require appointments, extra time, and planning for freight carriers. Most home owners do not have the equipment to ofﬂoad their own freight. Freight carriers are only responsible for getting the delivery to the rear of the truck for unloading. Without equipment to ofﬂoad, it is necessary to request a lift gate delivery. When receiving a home delivery, your shipment will not be delivered until the freight carrier calls you to schedule a delivery appointment. • Lift gate service delivery sometimes can take an extra day or two for the carrier to assign a truck with a lift gate due to availability. • All freight shipments are issued a PRO # or Tracking #. At the time of shipping we will send customer the following information by email: the shipping carrier website, the tracking or pro #, the address, phone, and email of the delivering terminal in your area. You may also contact them. • Freight carriers charge additional fees for the following services. These extra services are not included in the "Free Shipping" mentioned on our website. The equipment will normally be delivered on a semi with an enclosed trailer. The place of delivery must be easy for this truck to access. The trucker will not back down your 100 yard narrow driveway. If you do not have a place that offers easy truck access, then you can arrange to pick up your equipment at a nearby trucking terminal or arrange for the product to be shipped to an alternate location (for example, your buddy that owns the hardware store) that has truck receiving facilities. The truck terminal has equipment to help load your truck or trailer. Note: Beaver tail trailers, which have approach ramps that will not support the weight of a forklift, are not recommended for picking up lifts. When your product is loaded (from one of our warehouses) onto the commercial truck, it becomes your property. We make every effort to package freight in "bullet-proof" packaging; however, sometimes freight damage does occur. It is your (the customer) responsibility to inspect the shipment and file for any freight damage that may occur during shipping. This is the freight policy for damaged goods for all LTL carriers, not just those trucking companies contracted by our company. 1. Inspect your shipment thoroughly for any damages or signs of damage. Any signs of damage stop and tell the driver you want to open the carton for further inspection. Do not let the driver tell you it will be OK. Do not sign until You are sure their is no damage. 2. If you appoint someone else to receive your freight and they sign a clean delivery receipt but did not notice damage, you have no recourse. We cannot help you once the driver leaves with a signed delivery receipt of your acceptance of the freight. By signing the delivery receipt you or the person you appointed to sign are agreeing the freight was delivered in perfect condition. 3. 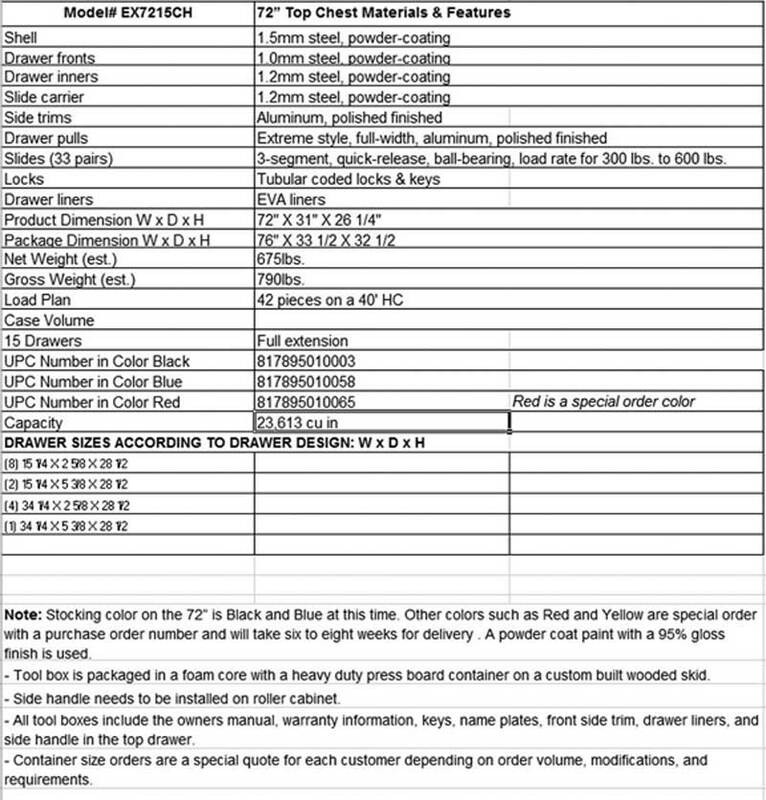 Count the pieces in your shipment and reconcile with the total on the delivery receipt you are asked to sign by the truck driver. 4. If for any reason - due to damage or missing pieces - you cannot accept the freight, refuse to accept it and call us immediately at 603-234-2612 or 603-219-0060. 5. Once you have signed the delivery receipt, you own the freight. There is no recourse that we, the seller, would have, and we cannot assist you with any claims. Extreme EX2404SC tool side cabinet comes with 4 drawers with roller bearing glides, as well as 2 adjustable roller bearing shelves.